Have you heard of Dashlane? According to a number of tech geeks, it is the world’s best password manager which can also be used as a secure digital wallet. 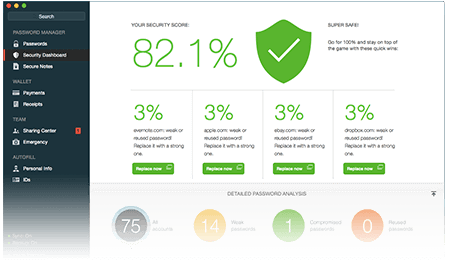 Dashlane now introduces a password changer where you can change your passwords with one click. Imagine remembering each and every password that you have to use to log in to various websites? In order to make your login details secure it is always advised to change your password regularly and use random passwords for each website without repeating any of them. How is this possible? Unless you have photographic memory or you are a superhuman, you cannot practically remember all your login passwords. Dashlane is an attractive software package that solves this problem. It is effective, loaded with a number of timesaving features and is also available for Windows, Mac, iPhone and Android. And most of all, the service is free. Installing Dashlane is not a difficult process. A click of a button gives you all the support that you need to install it while it works smoothly in Chrome, Safari, Internet Explorer and also Firefox. Dashlane also has the capability to import existing password vaults from other rival programmes. Let’s talk about its primary features! Yes. In simple terms Dashlane is a password memorizer. Everytime you type in your account name and password in to a particular web page and press the enter button, Dashlane will pop up and offer the service to memorize the information. 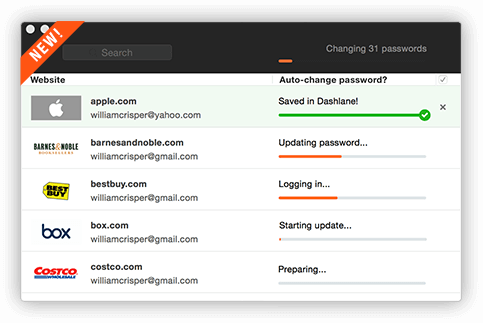 You can automatically login to all your accounts with Dashlane’s free password manager. You don’t have to worry about complex login forms with two or three fields such as bank accounts. Dashlane, simply manages it all. Experience one-click password changes on any of your favourite websites. There might be weak and compromised passwords that you use on a regular basis. Dashlane can change them online, save it and make them available for you on any device. It’s as simple as that! 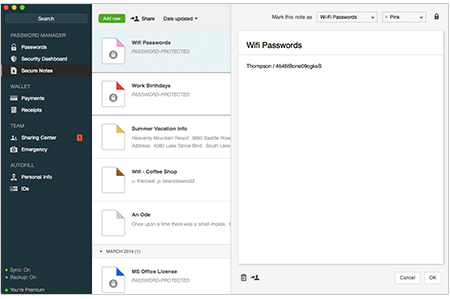 You can now easily keep track of your password health by identifying reused and dangerously weak passwords that are stored in your vault. You also have the opportunity to check on what accounts may have been compromised. You can now easily be notified on any type of security breach since Dashlane provides you with instant notifications / security alerts that are sent straight to your device. 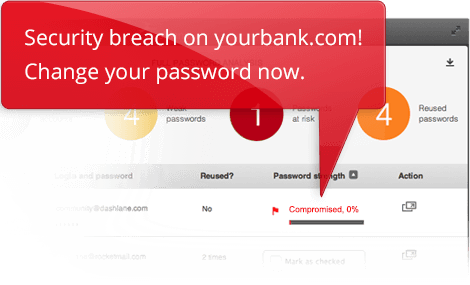 These security alerts are sent when any of your accounts that are linked to Dashlane are compromised. Always make sure to update your old passwords. 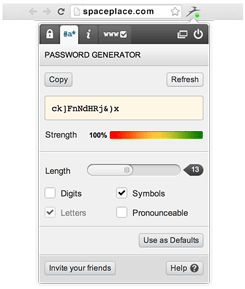 You can now generate new and strong passwords with one-click, save them to your password vault and also autofill them as you browse. You can keep all your top secret passwords, keys to software, surprise plans, wi-fi passwords all safe and make them accessible only to you. 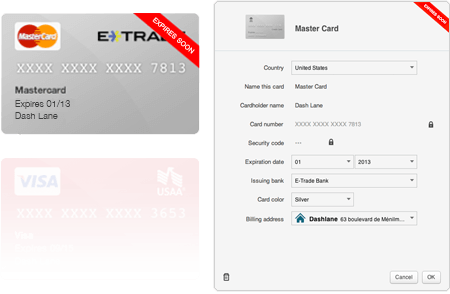 Dashlane also offers the service to link cards to your billing address and get notified when they are about to expire. Dashlane’s online wallet will do the remembering for you. How easy can life get?